Combining classic styling with the signature extravagance of Neil Lane jewellery, this stunning diamond ring boasts a desirable 3/4 carats of diamonds. Set on 14ct white gold, the diamond set shoulders lead up to a round solitaire framed with a sparkling halo. This engagement ring has a matching wedding band under code 1349589. 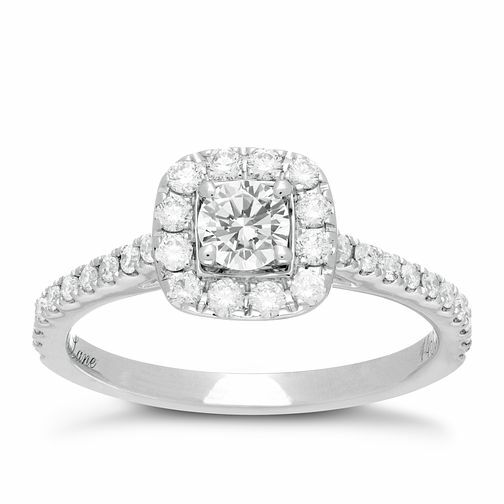 Neil Lane 14ct white gold 0.75ct diamond halo ring is rated 5.0 out of 5 by 6. Rated 5 out of 5 by Anonymous from Fantastic looking ring Couldn’t choose which ring to buy, but kept coming back to this one. A real eye catcher without being too in your face. Rated 5 out of 5 by Anonymous from Absolutely stunning ring! This ring is so stunning on! It's just so sparkly, I get complements on it every day. Comfortable to wear as well, would fully reccomend!